Russ Gaston got himself into trouble often in this April 1990 contest for single-A Savannah, according to The Greensboro News & Record. Gaston responded by getting out of just about every jam, The News & Record wrote, striking out six and picking up the win. Gaston was in his second professional season that year. He played in just one more. He seemingly couldn't get himself out of enough jams to make it out of single-A. 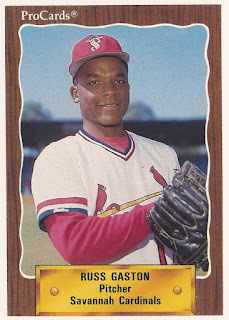 Gaston's career began in 1989, signed by the Cardinals as an undrafted free agent out of Southwestern Illinois College. Gaston played his first season in the rookie Arizona League. The right-hander went 2-3 in eight outings, seven starts. He moved to single-A Savannah for 1990. Over the full season, he got into 31 games, starting 17 of them. His ERA came in at 4.61. His record came in at 3-10. Gaston played 1991 between Savannah and rookie Johnson City. He got nine outings at Savannah and eight at Johnson City. He went 3-7 overall, with a 4.60 ERA. It was his final season as a pro.